A beach theme with outdoor nautical decor can include salt-tolerant plants indigenous to your seashore and nautical yard signs, mailboxes and ornaments. Browse my beach-theme photos for landscape ideas to use in your own yard. You don't have to live near the seashore to inject these nautical themes into your backyard landscaping. Beach landscape ideas work well in lakeside communities, too by association -- despite the fact that there are no real whales or lighthouses within hundreds of miles! Such details don't stop the true ocean-lover from decorating with beach themes. I've witnessed the use of outdoor nautical decor in yards located nowhere near water of any sort, whether fresh or salty. If you don't live near the seaside (yet are attracted to nautical decor) and question whether a beach theme is appropriate for your landscaping, realize that it's not an all-or-nothing proposition. Try installing an artificial pond and decorating just that area of the yard with a beach theme. 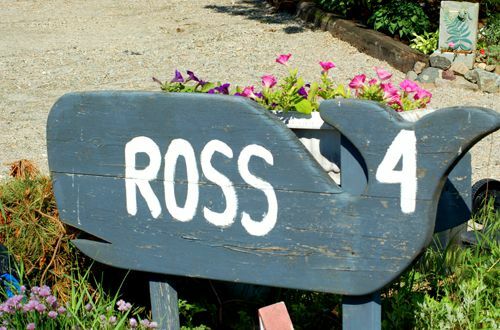 This whale carving is a perfect yard address sign for a home in a seaside community. For a house near the ocean, I'd call this "a whale of a yard sign." 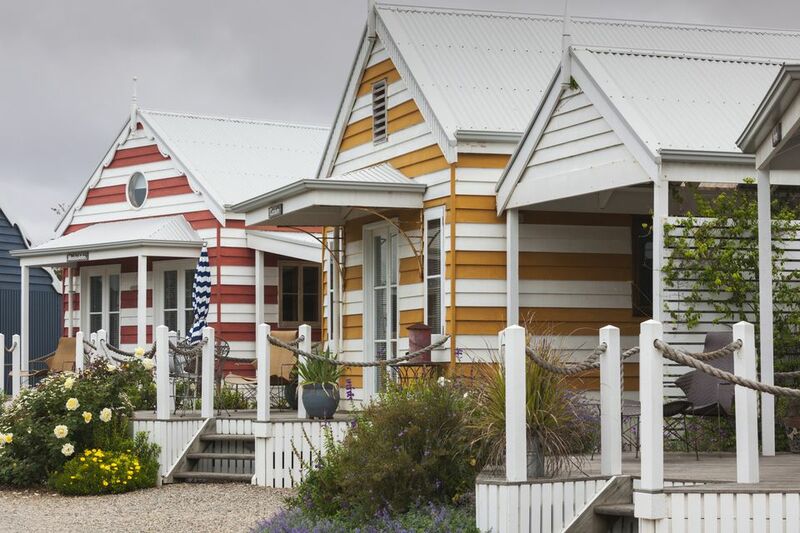 This is a case where a fence is purely decorative: Despite its massiveness, this beach-theme fence won't stop very much from coming onto the property. That's all right: its purpose is to evoke the ocean. Does the ship's chain used in the prior fencing photo strike you as too ponderous-looking...? Another beach-theme material for fencing is a much lighter material (although still plenty solid-looking): a ship's rope. If that's a bit too much nautical rope for your own landscape, tone things down by merely decorating a post or two with nautical rope. As a bonus, the posts in the photo above are also decorated with a carved lobster. Lighthouse ornaments come in many different sizes, styles and colors. The lighthouse in this picture is the focal point in a bed of tropical plants, although the setting itself is hardly tropical: I snapped this photo in chilly Maine (U.S.). The tropical plants will either be brought inside for the winter or treated as annuals. Rosa rugosa performs very well in seaside communities and has, in fact, been nicknamed the "beach rose." It is ubiquitous at the beaches of the Northeastern United States, because it is made of sturdier stuff than the typical types of roses that you see in people's yards. It grows so well in areas such as coastal New England that it has naturalized there in some cases. R. rugosa is so entrenched in seashore areas such as Rye, New Hampshire that many residents do not realize it is actually indigenous to the Far East. They are tolerant of poor soils. They do not mind salt -- whether it be the salty soil and salt-laden breezes along the ocean or the road salt that contaminates the ground along a highway (an alternate common name for the shrub is "salt-spray rose"). Not only do these bushes furnish ornamental value along the seashore, but they are also sometimes planted in sand dunes and along beach roads to prevent shore erosion. Wild birds and other animals, such as deer, eat the rose hips (that is, the fruit of the beach rose). High in vitamin C, humans can eat the rose hips, too. Several varieties and/or cultivars of beach roses have been been put on the market, such as the aptly named 'Sandy,' and plant attributes (including floral color) will vary from one to another. But what follows is a general description of the species (wild) plant. Beach roses usually reach a height of 4-6 feet, with a similar spread, but they have been known to become even larger than that. They can push up suckers, thereby spreading to become colonies or "thickets" over time. Birds often nest in the thickets of beach roses. The stalks are covered in sharp thorns, making this a good hedge plant for homeowners who wish to discourage trespassers. The leaves are dark green in color. The (usually) fragrant flowers are most commonly either pink or white. These 3-inch blooms flower mainly in late spring and early summer. Suited for growing in USDA plant hardiness zones 3-9, you can install beach roses either in full sun or in partial shade, but plants will be healthier and flower better when given full sunlight. Fertilizing is generally not necessary, but do provide them with good drainage. Space them so as to provide sufficient air circulation. Since mature width is around 6 feet, space new plants at least 6 feet apart, unless you are trying to form a hedge. Water the plants at ground level, not overhead. Along with good air circulation, this will help prevent disease (although this hardy are, to be sure, relatively disease-resistant). But ivy geranium, shown in the picture above, is one plant that seems to thrive at the seashore. Another plant popular for hanging baskets that thrives near the ocean is lantana. Another great idea is to use these plants in window boxes if you live near the ocean. Don't think that you have to live in the sub-tropics to enjoy palm trees. Among the various types of palm trees, some are hardy. Denizens of cold climates also have the option of treating palms as annuals, or potting them up and taking them inside for the winter. Not all palm trees are as gigantic as the ones in the picture above: some are small enough to make good container-plants. When you think about the various types of wildflowers, wild beach vegetation may not come to mind immediately. But some of us do have strong "beach associations" with the native plants that grace our local beaches. Native plants also carry the advantage of being adapted to your particular climate. Check with your local wildflower nursery for the availability of native plants that would fit in with a beach theme. The seaside plant in the picture above goes by various names, in case you're interested in researching it: "woolly beach heather," "wooly beach heather," "false beachheather," etc. Woolly beach heather (Hudsonia tomentosa) is native to the Great Lakes and Atlantic Coast region in North America. These homeowners were smart to grow beach grass (or "dune grass") in their small front yard, rather than struggling to grow lawn grass where it really doesn't belong. The only "carpet" you need at the beach is sand. Like the ornamental grasses with which you are probably familiar, beach grass is meant to grow tall and look pretty, rather than functioning as a carpet as lawn grasses do. Nor do you have to mow it (always a plus). I've also seen these fish mailboxes in brown, but I think the green fish shown in the picture above provides better color for seashore landscaping. Like a yard address sign (see picture #1 in this beach-theme gallery, showing a whale sign), a mailbox is one of the first elements in a yard to catch the viewer's eye. So if you're developing a beach theme for your landscaping, the mailbox is a good place to begin. The next few pictures all show examples of clever mailboxes for seashore communities. The mailbox pictured above is similar but exploits the fishing theme from a subtly different angle. For here it is a fishing lure rather than a fish that will hold the day's mail. I could easily do without the fish and seahorse figures floating above the lobster trap; in my opinion, they clutter a scene that requires no more than the lobster trap to get its message across. But in the picture above, we see a mailbox with a lighthouse theme. The lighthouse mailbox has plenty of company, with separate lighthouse ornaments in the background. Did you ever sell seashells by the seashore when you were a kid (or at least collect them)...? The kids will love this mailbox made with scallop shells, sand dollars, and the like. It's the custom mailbox post rather than the mailbox, itself that is the center of attention here. Could it be Captain Hook's mailbox? The picture above shows another interesting use of ship's chains in landscaping by the ocean: as mailbox decorations. Whether it's a beach theme or some other theme you're trying to incorporate into your landscaping, the mailbox is a good place to begin with it. The proximity of the mailbox to the street means that passersby will be sure to see your decor in this area of your yard. The right mailbox decoration can set the mood for your whole landscape. Without the duck decoy in the picture above (indicating scale), you wouldn't be able to tell that these aren't real boats! But what if you don't have a garden pond? Never fear, you can still incorporate model ships into a beach theme for your yard. In the photo above, a model ship decorates a post. The heron statue in the background provides complementary decor. Talk about a focal point literally "anchoring" a landscape design!